The Rt. Hon. Vincent Massey C.H. Chapter began as a Junior Chapter in 1940 under the sponsorship of the Louisbourg Chapter. The name of Vincent Massey was chosen because, at the time, the Rt. Hon. Vincent Massey was the new Canadian High Commissioner to Great Britain. The Junior Chapter continued as such until October 15, 1953 when 14 former members were presented with a Charter for the new Primary Chapter...thus evolved the Chapter name Vincent Massey. Bursaries have been presented to local high schools, Sydney Academy and Riverview High School, as well as Cape Breton University. We continue to donate each year to the Kiwanis Music Festival, the Summer Reading Program at the Cape Breton Regional Library and support Children's Reading Programs. Cape Breton Regional Hospital has been a major project for many years. Our Chapter has purchased and donated numerous and much needed equipment for the hospital. We have provided items for the Oncology Unit, equipment for Cape Breton Cancer Centre, donations to the Hospital Comfort Fund, the Pediatric Department, as well as furnishing a room in the Palliative Care Centre. Donations were also given to the Whitney Pier Youth Club; Every Women's Center received personal items for their clients, donations were made to the Cape Breton Victoria Regional School Board Breakfast Program and hats, scares and mitts are collected and donated to the women's shelter "Transition House". Money raised from the Chapter's Autumn Treasures Annual Art Show Exhibition & Sale enables IODE to support local community programs. This year one of the recipients is Brookland Elementary School in Sydney which was severely affected by last fall's flood. 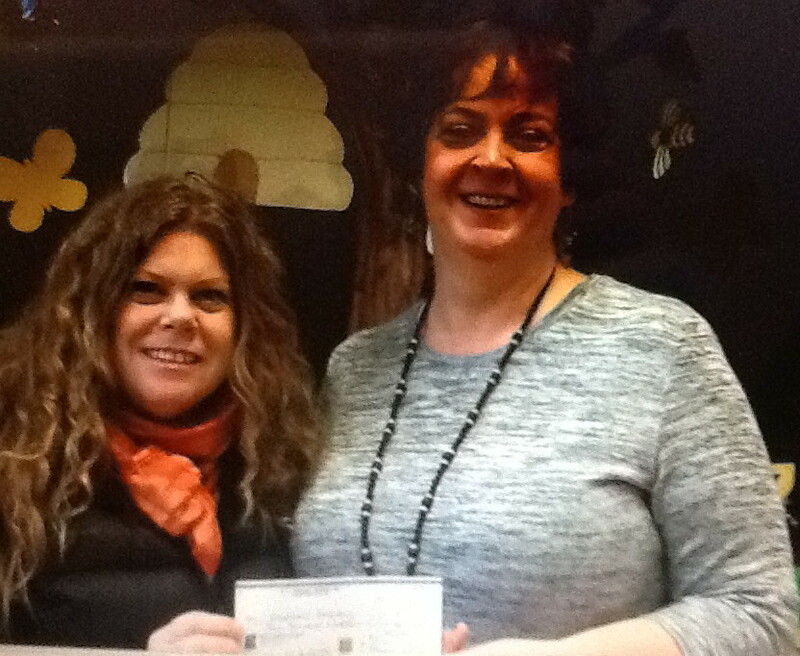 School principal, Joyce Lively, is seen here as she accepts a $500 donation from IODE member Stephanie Gouthro. The donation was given to replenish art supplies destroyed by flood waters. WeirdBeard is a group of creative and passionate volunteers who produce theatrical experiences using life-sized puppets in "blacklight". The puppeteers are youth and adults with Downs Syndrome and their families. The IODE Rt. Hon. Vincent Massey Chapter was pleased to help sponsor the 2014 production of "The Three Little Pigs" and the 2015 production of "The Tortoise and the Hare". The group made a special appearance at the IODE Cape Breton Area Conference held in Baddeck in September 2015. Members of IODE Rt. Hon. Vincent Massey, C.H., Sydney, NS attended a Citizenship Ceremony during the 300th Anniversary of the Fortress of Louisbourg. 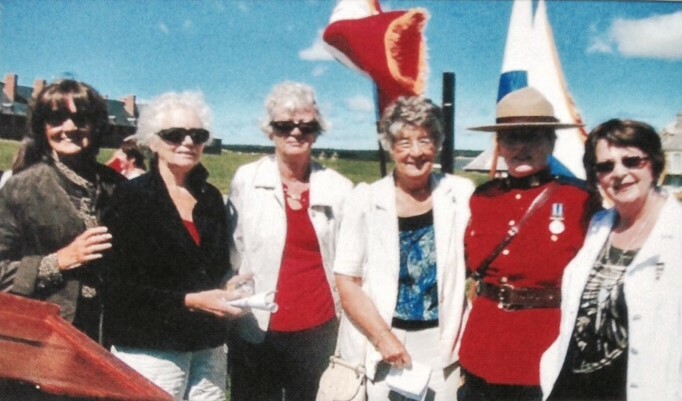 Shown (l-r) President Mora Smith, Pamela Baker-Clark, Lorraine Walker, Velma Rhymes, an RCMP Corporal and Sheila MacDonald. The Fortress of Louisbourg is a national historic site and the largest 18th century reconstruction project in North America. More than a dozen buildings are open for viewing and during the summer re-enactors populate the streets of the restored fortress. Visit and relive a period of time in Canada's history. Attendance at Citizenship Courts and the Laying of Remembrance Day Wreaths each year is supported by our Chapter. Our Chapter has been sponsoring Art Shows since the 70's and in 1995 we presented a Certificate of Appreciation to Royal Canadian Legion Branch 12 for donating their Legion hall for our shows. Chapter members participated in the 40th and 50th Anniversaries of Canadian Citizenship Ceremonies in 1987 and 1997. Department of Citizenship and Immigration was moved to Sydney in 1984 and our chapter participated in a reception to celebrate the move and we received a special invitation celebrating the 10th anniversary of this move. This is my sixth year as President of the IODE Rt. Hon. Vincent Massey C.H. Chapter and each year the role becomes more interesting. We have a great group of hard working ladies. Our main fund raising event is our annual Art Show and Sale which takes place in October. Approximately forty-five local artists exhibit their art for sale. We also have local artists in glass creations, jewellery, quilts, etc. who exhibit their unique works of art for sale. Each year the Featured Artist donates a painting which we sell tickets on. At Christmas time we hold our meeting at a local restaurant, enjoy a lovely meal followed by a gift exchange, making for a fun filled evening . At various meetings throughout the year we put together a gift basket and draw for a winner for all the goodies. 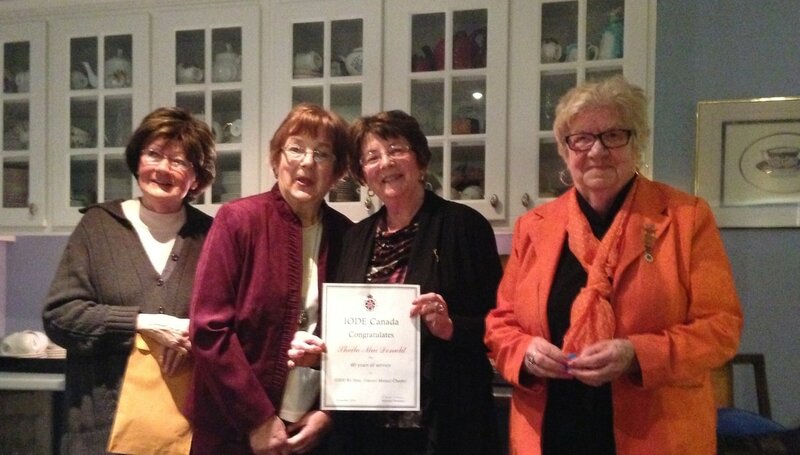 Lifetime Memberships Awards were presented to Nonie MacLeod (2nd from L) and Kathy Ojolick (2nd from R). 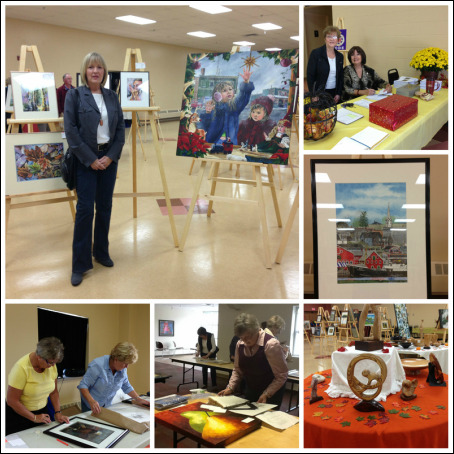 A major fundraiser for over 40 years has been the "Autumn Treasures" Annual Art Exhibition & Sale of Paintings and Fine Art, held in 2015 at the Grand Lake Road Fire Hall. Approximately 45 artists participated and refreshments are served. Each year the featured artist donates a painting for the chapter to sell tickets with the draw taking place the last night of the show. Proceeds from this show are disbursed through the various projects and organizations we support.